Two men said they'd been lent the canoe by a man in a pub and had been using sticks instead of paddles. They claimed they'd ended up aground because of the unwelcome attentions of a seal! There were two shouts for the Cowes RNLI at the weekend. 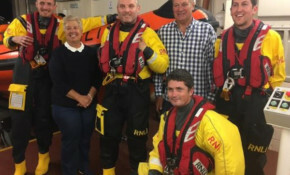 Cowes RNLI were able to help a yachtsman who suffered a suspected minor stroke this morning. The charter boat ran out of fuel and after the fuel hatch was opened the woman fell and hit her head. Cowes RNLI were able to attend and bring the passengers back on shore. Our thoughts are with family and friends of the man whose body was found in Newtown Creek this morning. We're sure you'll agree, Radek has managed to capture the serenity that Newtown Creek offers its visitors and is a worthy choice for our Picture of the Week. Details of Murray-win-induced incident has reached the national news. Find out who won this week.